Although it is likely that the FMCSA’s mandate requiring the use of electronic logging devices (ELDs) on commercial vehicles will not go into full effect until 20163, the new HOS regulations may be difficult to manage via paper logs.1 Plus, electronic logs not only assist in tracking hours, but can help reduce fines, improve CSA scores and decrease time spent on HOS administration. 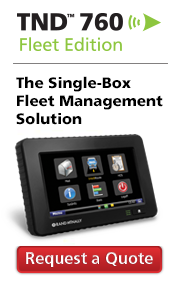 Rand McNally’s TND™ 760 helps you to improve compliance more easily, and manage your overall fleet. The TND™ 760 offers a low cost, high value solution, and quick return on your investment. Additionally, you benefit from high driver acceptance, leading truck-specific navigation, unmatched customer support and integration with key TMS programs. With more than 75 years in trucking innovation, and a brand you already know and trust, Rand McNally and the TND™ 760 are well suited to evolve with you as your compliance needs continue to change. Each year, the Mid-America Trucking Show proves to be “the three biggest days on the heavy-duty trucking calendar,”4 and this year was no exception. The 2013 show, held March 21-23 in Louisville, Ky., included 1,072 exhibiting companies from 43 states and nine countries, more than 78,000 attendees from 50 states and 79 countries, 238 media correspondents and 1.2 million square feet of pure heavy-duty trucking enthusiasm. 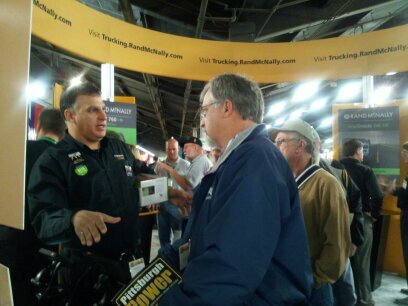 At the Rand McNally booth, we gave out 850 Motor Carriers’ Road Atlases, 250 IntelliRoute® TND™ hats and 250 pens. Plus, we supported almost 200 customers with device updates, and offered TND™ 760 demos. We also showcased and demoed the IntelliRoute® TND™ 720 LM and the new TND™ 520 LM, available later this month. For more on Rand McNally product updates announced at MATS, read the Transport Topics story here. The TND™ 760 is a cost-effective electronic logging system, mobile communication solution, and fleet management tool all in one. With three different service plan options to fit a variety of needs, the TND™ 760 coupled with the Rand McNally Connect web portal, is equipped to benefit anyone from the owner operator or independent driver to large fleet operations. That’s why now, in an industry first, Rand McNally is offering the TND™ 760 at retail locations. Travel Centers of America (TA)/Petro, the largest full-service travel center company in the United States serving the professional driver community, is the first retailer to carry the TND™ 760 devices in its stores. Additionally, TA will offer professional installation services for the devices at select locations. Those who purchase the TND™ 760 at TA, then sign up for a service plan (starting at less than $20/month) at randmcnally.com/activation. Installing the device is quick and easy, and can be done in 30 minutes or less with a suction cup mount and cable. Or, those who prefer may opt to have their device installed at 20 select TA locations. Installation services will be available at most TA locations in the near future. To learn more about the TND™ 760 including service plan options and features, click here or call 1-800-789-6277. And, the next time you find yourself at a TA, look out for the TND™ 760 on the shelves. 1 Straight, B. (April 1, 2013). Sudden shift toward electronic log usage. Fleet Owner. 2 Department of Transportation. Federal Motor Carrier Safety Administration. Hours of Service of Drivers. 3 Cama, T. (April 8, 2013). FMCSA Will Miss Deadline for ELD Rule, Ferro Says. Transport Topics. 4 Post-Show Report. 2013 MATS: Another Incredible Year.